Categories: appliers, FabFree Group Gifts, Free, group gifts, groups, jewelry, mesh, shoes | Tags: Beloved Jewelry, fab free, fabfree, fabulously free in SL, free in sl, group gift, Nala Designs, Second Life, Second Life Free, second life gifts, sl, SL Freebies, sl gifts, tiar | Permalink. Nala Designs has returned inworld and has a new FabFree group gift for us! Categories: all-in-one outfit, FabFree Group Gifts, Free, mesh | Tags: 0L, fab free, fabfree, fabulously free in SL, free in sl, gift sl, group gift, Nala Designs, Second Life, Second Life Free, second life gifts, sl, sl free, SL Freebies | Permalink. Happy Fri-Yay Fab Free’rs! I don’t know about you but I am so glad the weekend is here. It’s been along week and I am ready to relax a little bit. I also am in need of some freebie retail therapy. Thankfully I have the pleasure of sharing with you Nala Designs for this weeks edition Fab Free Designer Friday. There are many opportunities at Nala Designs for FREE and inexpensive items. The above photo is of the Nala Designs front desk. Here is where you can join the Nala Designs group and you’ll want to check out the little pink gift box. It’s a 5 linden gift. Most of the Nala Designs items are mesh trendy casual women’s clothing items in great colors and patterns. Additionally there are a few formal gowns and dresses, and I even spotted a men’s formal suit. There’s also a lingerie department on the second floor. The Nala Designs group is just 50 linden to join. Directly to the right of the desk you’ll see the wall of information. 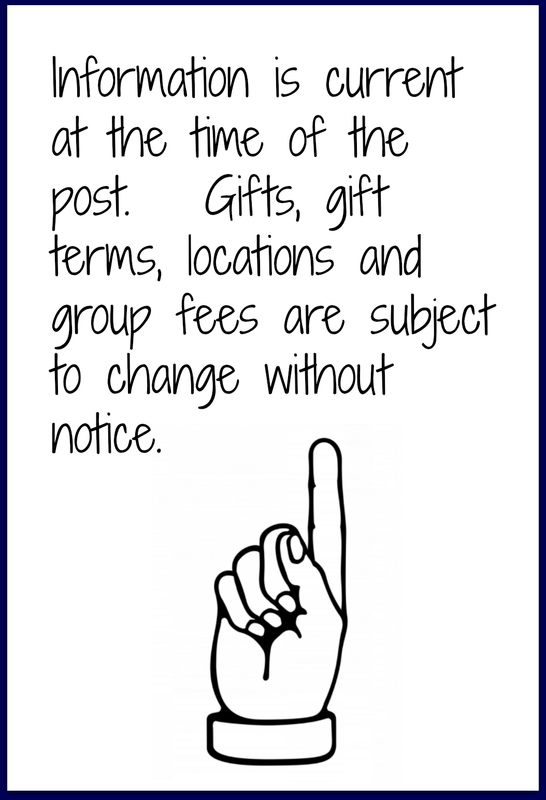 Check out that information space for info on hunts, events, and other group affiliations. To the left of the front desk you’ll see two discount vendors next to a pretty mirror. You can score two 50L items there. Also, the mirror will let you teleport to a discount area. As you travel through the store toward the back of the first floor, you’ll find the FREE Fab Free exclusive group gift. This is for Fabulously Free in SL group members only, so don’t forget your Fab Free tag! 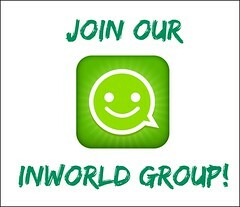 If you’re not already a member of the Fab Free group, it’s always FREE to join. At the very back of the store you’ll also see a Midnight Mania board, and a Night Prize Board. I was able to join the Night Prize board without a group tag. Also while you’re exploring the first floor, keep your eye out for a round side table with a little blue gift package. There you’ll find a 10 linden swimsuit, it’s on the right side of the main floor. As if these great gifts and discounts were not awesome enough, there’s more to be found upstairs. Once you’re upstairs, you’ll find two additional group gifts for other groups among the regular store vendors. The upstairs is also where the Nala Designs group only Lucky Letter boards can be found. You will need to be sure to wear the Nala Designs group tag to participate in the Lucky Boards. Needless to say there are plenty of Fabulous reasons for you to visit Nala Designs. 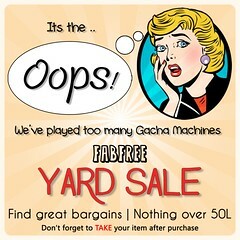 Happy Shopping Fab Free’rs! Categories: dress, FabFree Group Gifts, FF Designer Of The Day, formalwear, Free, group gifts, groups, lingerie, Lucky Board, mesh, midnight mania, other, pants, places, shirt, swimwear | Tags: $0L, 0 linden, cheapie, Exclusive Group Gifts, fab free, Fab Free Designer Friday, Fab Free Designer of the Day, fabfree, fabulously free in SL, fashion, Fashion in SL, FFDF, free fashion, free gifts, Free Group Gifts, free in sl, freebie, gifts, group gifts, groups, Lucky Letter Board, midnight mania, NALA, Nala Designs, Night Prize, Second Life, Second Life Freebies, sl, sl freebie, women's fashion | Permalink. One more to update today! Nala Designs has a sweet new FabFree group gift for you too! How to grab your gift! 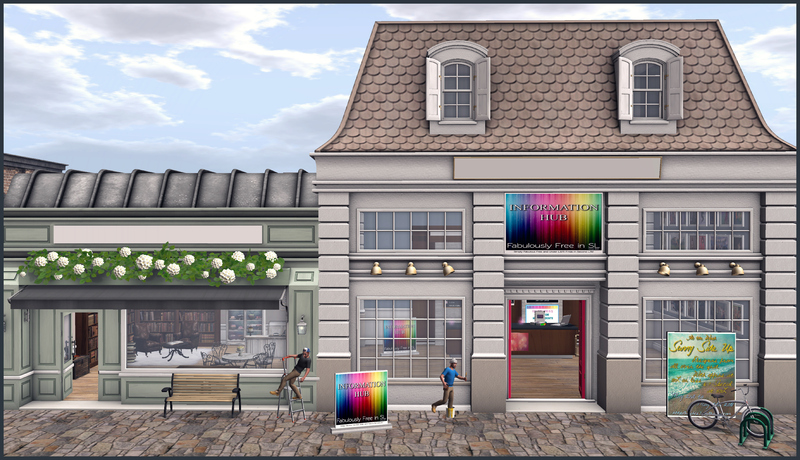 Visit our inworld Fabulously Free in SL Info Hub and click the listing on the sign by the party table. Categories: dress, FabFree Group Gifts, Free, group gifts, groups, mesh, shirt, skirt | Tags: 0L free, 0L gift, fab free, fabfree, FabFree group gift, fabulously free in SL, free in sl, freebies sl, group gift, Nala Designs, Second Life, sl, sl free | Permalink. Hey Fab Folks! While I was at Nala Designs the other day picking up the Avangardista group gift I showed you [HERE], I noticed that upstairs in the outlet area there are 2 group lucky boards. Both prizes are really nice, however this one in particular that I am wearing today really caught my eye! The group is 100L to join, but once you join, you can take advantage of group gifts, lucky boards and midnight mania offers that are group exclusives. If your lucky letter comes up on the board, you’ll be gifted the Rachel Red Outfit that includes the lace textured leather jacket and grey leggings shown on my avatar. The jacket comes in classic and fitted mesh in XS – XL, and the pants come in standard mesh sizes XXS-L, Belleza, Slink, Maitreya, TMP. Alpha layers are included for both, should you require them. I also wanted to take a minute to thank Izzy C. for sending me this adorable Sheltie that I have decided to call Daisy! As instructed, as a precaution… I am keeping it far away from Carson so that it is not abducted as my little Dalmation pup was back in December [HERE] when his grinchy side snuck out and he tried to steal Christmas. He does seem in brighter spirits this year, however I still have my eye on him. If you’d like one of your own JIAN Sheltie Companions, you can try your luck for one at this round of The Epiphany for just 50L per play. Categories: fitted mesh, gacha, groups, Lucky Board, mesh, outerwear, pants, pets, shirt | Tags: 50L, Bueno, Catwa, fab free, fabfree, FabFreeF, fabulously free in SL, free fashion Second Life, free fashion sl, free in sl, freebies sl, gacha, Glam Affair, Ikon, Jian, Le Poppycock, Love Trill, lucky board, maitreya, Nala Designs, Second Life, Second Life Free, sl, The Epiphany, TRUTH, Winter Trace | Permalink. Hello and happy weekend, FabFree-ers! One of my favorite colors is emerald green so when I saw Nala Designs was offering this gorgeous deep emerald ‘Strappy Dress’ for their Second Life Frees & Offers gift, I was all over it. 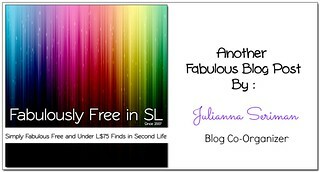 Not only is the dress free with your free SLF&Os tag, it comes in a plethora of versions. You get the classic Mesh sizes XS-XL, you also get FitMesh version S-L and appliers for Belleza, SLink and Maitreya. Very generous indeed. I also ran over to pick up the latest Group Gift from Damselfly yesterday. This is “M’Lissa” style and it comes with all the HUDs for colors you could ever want. I, of course, went with my red since red heads wear green like no one else. 😉 The Damselfly group is 50L to join and with group gifts like this it’s worth every penny. Categories: appliers, dress, fitted mesh, formalwear, Free, group gifts, groups, hair, mesh, skirt, Uncategorized | Tags: 0L, damselfly, dress, fab free, fabfree, fabulously free in SL, fashion, free, free in sl, free sl, freebie, freebies, freebies sl, gift, gifts, group gift, Ikon, Julianna Seriman, Lumae, maitreya, Nala Designs, Second Life, Second Life Frees & Offers, sl, SLink | Permalink.